Students love catching small organisms like insects, other arthropods, and amphibians. But in many ecosystems (any area with a complex set of interactions between biotic and abiotic factors), they need help figuring out where and how to find and catch critters. 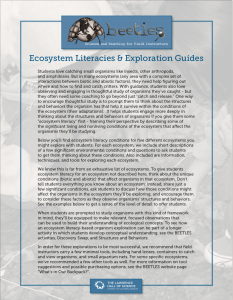 In this document, you’ll find ecosystem literacy conditions for five different ecosystems you might explore with students. For each ecosystem, we’ve included short descriptions of a few significant environmental conditions, questions to ask students to get them thinking about these conditions, as well as information, techniques, and tools for exploring each ecosystem.